Download "2015 Product Disclosure Statement"
2 Contents 1. About NSF Super 2. How super works 3. 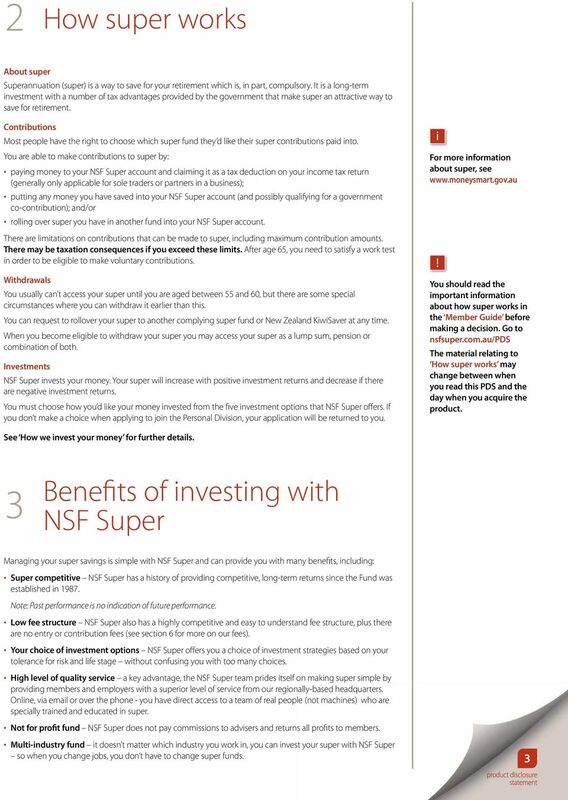 Benefits of investing with NSF Super 4. Risks of super 5. 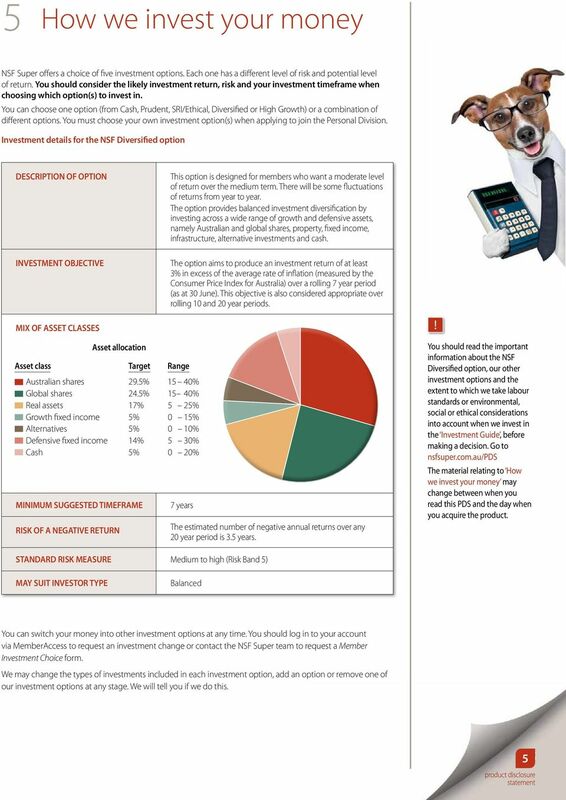 How we invest your money 6. Fees and costs 7. 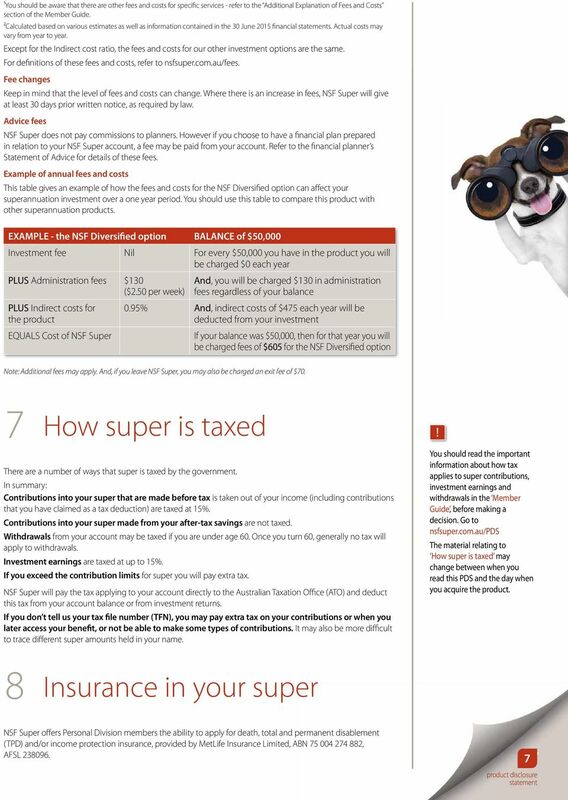 How super is taxed 8. Insurance in your super 9. 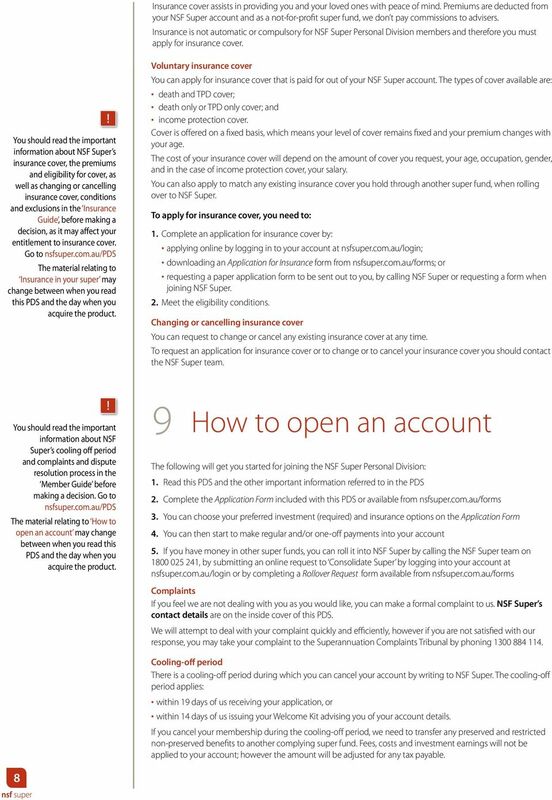 How to open an account Please read this This Product Disclosure Statement (PDS) provides a summary of the key information you need to make a decision about NSF Super. It contains a number of references and links to additional information that is part of this PDS, marked with a. This is important information you should read before making a decision to invest in this product. 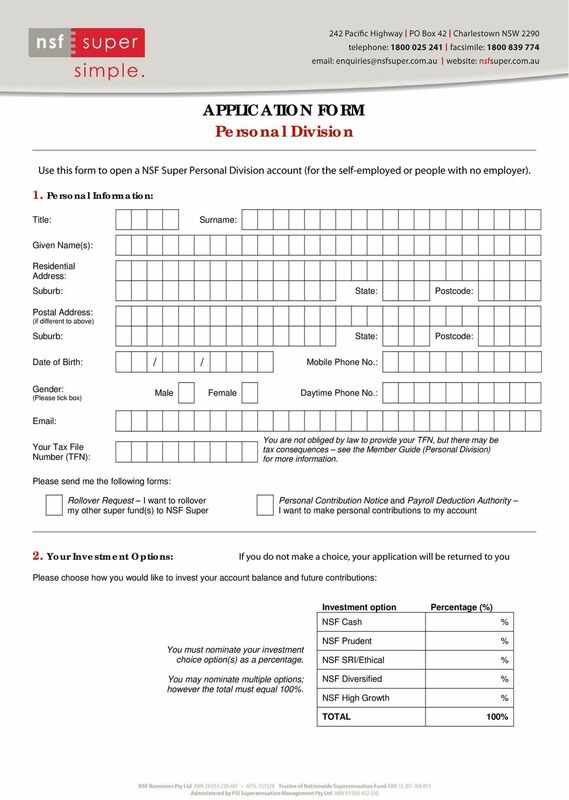 This PDS is for people joining NSF Super as a self employed person or choosing to join as an individual. 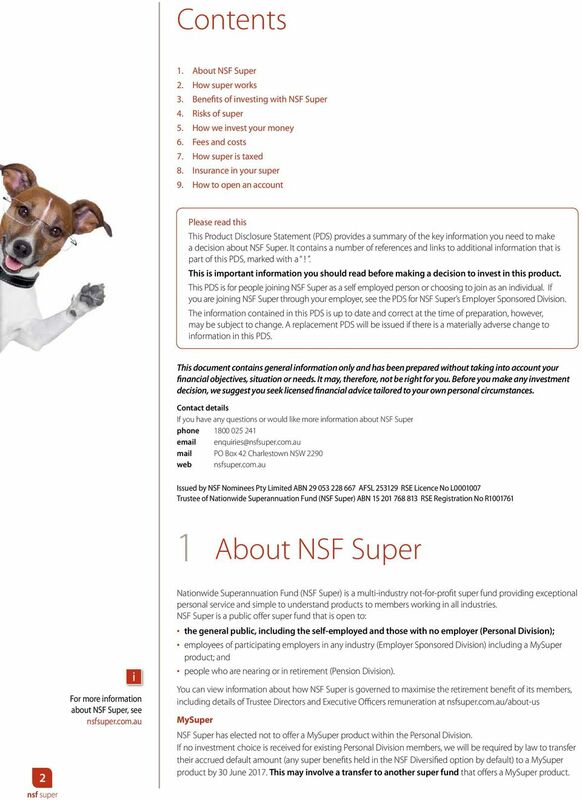 If you are joining NSF Super through your employer, see the PDS for NSF Super s Employer Sponsored Division. The information contained in this PDS is up to date and correct at the time of preparation, however, may be subject to change. A replacement PDS will be issued if there is a materially adverse change to information in this PDS. This document contains general information only and has been prepared without taking into account your financial objectives, situation or needs. It may, therefore, not be right for you. Before you make any investment decision, we suggest you seek licensed financial advice tailored to your own personal circumstances. 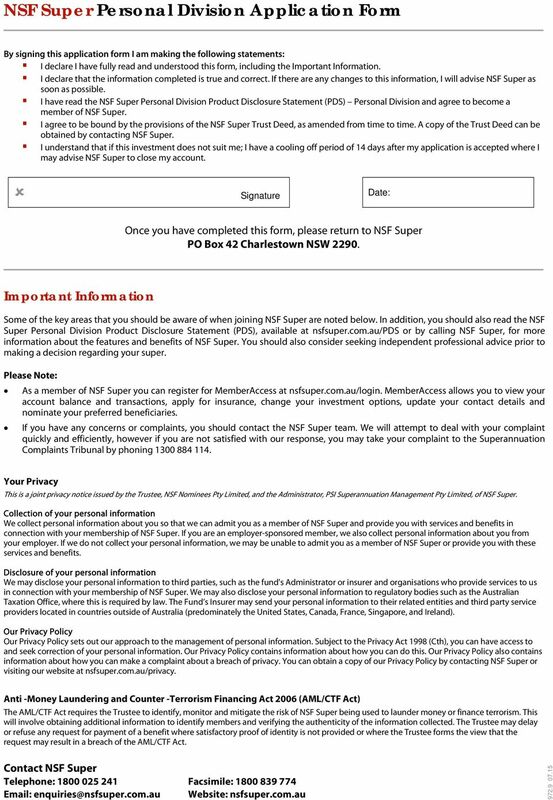 Contact details If you have any questions or would like more information about NSF Super phone mail PO Box 42 Charlestown NSW 2290 web nsfsuper.com.au Issued by NSF Nominees Pty Limited ABN AFSL RSE Licence No L Trustee of Nationwide Superannuation Fund (NSF Super) ABN RSE Registration No R For more information about NSF Super, see nsfsuper.com.au i 1 About NSF Super Nationwide Superannuation Fund (NSF Super) is a multi-industry not-for-profit super fund providing exceptional personal service and simple to understand products to members working in all industries. 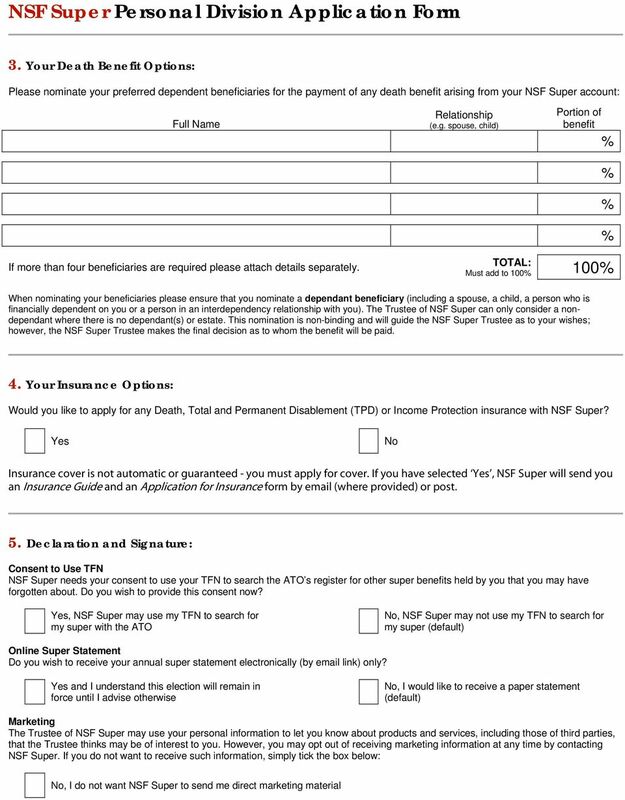 NSF Super is a public offer super fund that is open to: the general public, including the self-employed and those with no employer (Personal Division); employees of participating employers in any industry (Employer Sponsored Division) including a MySuper product; and people who are nearing or in retirement (Pension Division). 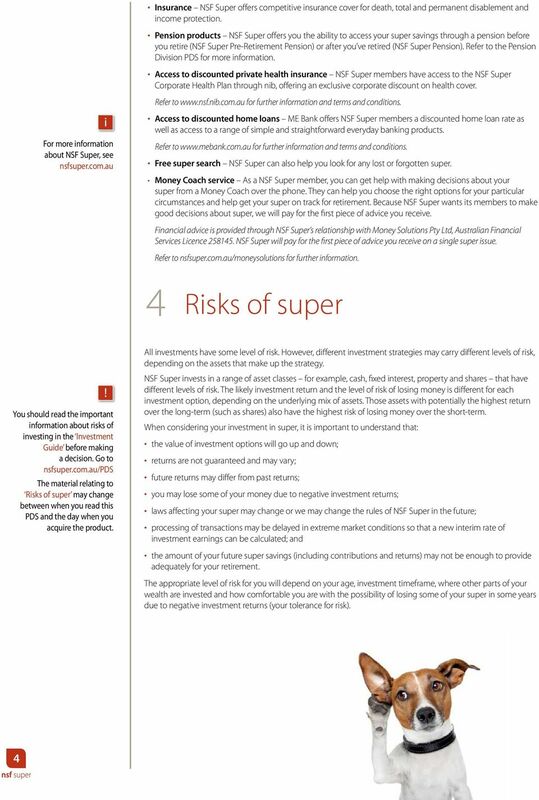 You can view information about how NSF Super is governed to maximise the retirement benefit of its members, including details of Trustee Directors and Executive Officers remuneration at nsfsuper.com.au/about-us MySuper NSF Super has elected not to offer a MySuper product within the Personal Division. 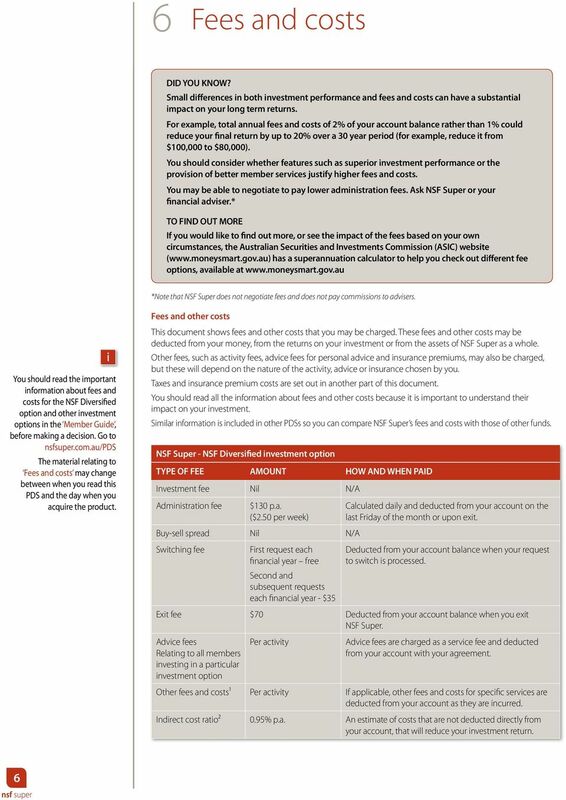 If no investment choice is received for existing Personal Division members, we will be required by law to transfer their accrued default amount (any super benefits held in the NSF Diversified option by default) to a MySuper product by 30 June This may involve a transfer to another super fund that offers a MySuper product. Hostplus Superannuation Fund and Hostplus Personal Super Plan. 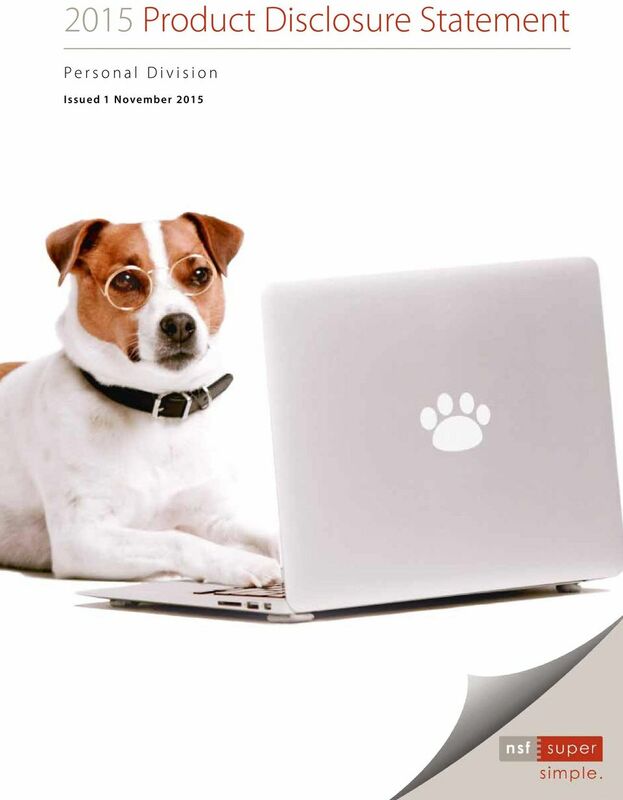 Member forms 26 September 2015 Which forms do I need? 1 Membership form. Use this form if you are joining Hostplus through your employer.